South Africa's squad members have been made to sign a code of conduct upon arrival at their training camp for Saturday's World Cup qualifier. The move is aimed at preventing any repetition of the excessive partying after their last match in Durban. The incidents were widely reported in local media and happened despite Bafana Bafana losing to Cape Verde. 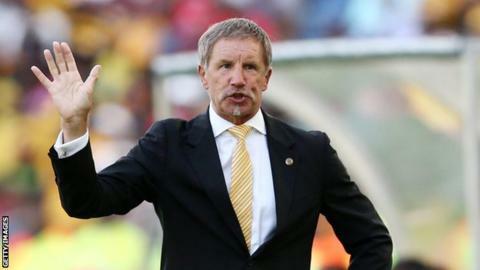 "When we are professional athletes representing our country we don't do that," coach Stuart Baxter said. "It will be dealt with in house. What does not help are people making up stories that are… hugely inflated and missing the mark completely." The squad also watched a presentation on professionalism as Baxter also partly defended his players despite the antics being criticised by disappointed fans. "I am pretty sure that over the last 50 years people have looked with admiration at boys taking a drink or 'boys being boys'," he said. On arrival this week to prepare for the qualifier against Burkina Faso at Johannesburg's Soccer City on Saturday, the players had to watch a presentation called 'The 24-hour professional'. "It reminds people that we are 24-hour professionals nowadays," the coach explained. ''When I played in England we were two-hour professionals. We came, we trained, we worked really hard and then everybody went to the pub. "It has become 24 hours now because the demands on our jobs are so heavy that if you are not professional you cannot keep up with the rigours of the modern game." Back-to-back defeats by Cape Verde last month - plus Fifa ordering a replay of last November's match against Senegal because of match fixing - has left South Africa at the bottom of Group D with just a single point. But they still have a chance to qualify for World Cup in Russia next year if they win their last three matches - Saturday's home clash against the Burkinabe followed by home and away fixtures against Senegal next month.